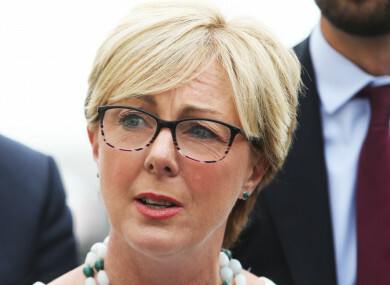 MINISTER FOR SOCIAL Protection Regina Doherty has said she has “absolutely no confidence” that the North-South Interconnector will be completed. The Meath East TD said the proposed energy project faces a number of legal challenges as well as the outcome of Brexit. Speaking to LMFM, Doherty said: “The first obstacle is local to the Republic, where the Supreme Court hearing is set for two days next week on a judicial review of the project to date. Doherty added that Brexit is “probably the biggest obstacle of all, facing both north and south in the coming weeks and months”. The government this week considered two reports into the interconnector and insisted that proposals by EirGrid to use overhead power lines will go ahead. One of the reports, which looked at the cost and technical feasibility of building the interconnector underground, found that using electricity pylons was the preferable option by a ratio of 3:1. The plans envisage a 400kV overhead electric power-line linking an existing substation in Woodland, Co Meath, with a planned substation in Turleenan, Co Tyrone. 299 pylons are expected to be built across Cavan, Meath and Monaghan as part of the project, which An Bord Pleanála approved in 2016. The proposals have angered locals in the three counties, who have voiced concerns about potential impacts on the environment, their health and property prices. Doherty today said an underground option would be about €450 million more expensive, but may be preferable. She said pylons are “at odds with what lots of people want”. Speaking on Morning Ireland on RTÉ Radio 1 yesterday, Minister for Communications Denis Naughten said Brexit will not impact the project. He also pointed to the potential offered by the overground option, stating: “The benefit of an overhead line is that you have the opportunity for investment along the route of that line. A spokesperson for the Department of Communications, Climate Action and Environment told TheJournal.ie the Department did not wish to comment on Doherty’s remarks. Email “Regina Doherty has 'absolutely no confidence' North-South interconnector will happen”. Feedback on “Regina Doherty has 'absolutely no confidence' North-South interconnector will happen”.